DMV.com was created to help simplify your life by providing you with all the vehicle related information and New Hampshire DMV services you may need, in one place. Quickly find information and services regarding driving records, vehicle registration, drivers license renewal, license plate renewal, getting a learners permit, and finding a New Hampshire Department of Motor Vehicles approved traffic school. Learn about DMV drivers license services in New Hampshire. Residents must obtain an NH drivers license before they can drive legally. Order a New Hampshire DMV driving record today. Requesting NH driving records online is the easiest way to get a DMV driving history. Obtain low cost car insurance in NH at our online car insurance center. Auto insurance is required by the DMV for all cars registered in NH. Taking an NH traffic school course may qualify a driver for discount car insurance. Discover the benefits of choosing online traffic school. Passing a New Hampshire DMV practice test can help you earn a license. Take a DMV practice exam to test your knowledge for the license exam. 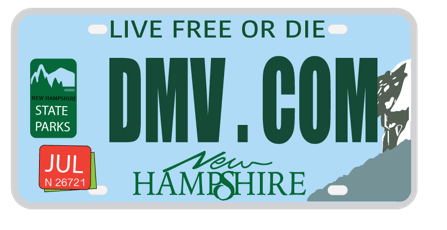 Learn about New Hampshire car registration services offered by the DMV. Official NH vehicle registration is required for vehicle owners. New Hampshire drivers education is required by the DMV for license applicants younger than 18. Learn more about NH drivers ed requirements and sign for an online course today. The New Hampshire DMV requires residents who want to transfer ownership of a vehicle to complete a bill of sale form. Learn how to pay a ticket online in NH or contest a ticket instead. Traffic tickets in NH require drivers to respond or face DMV penalties. Getting a DUI in New Hampshire results in license revocation and other consequences. Learn more about NH DUI penalties imposed by the DMV. Buying a car online in NH can assist your car registration at the NH DMV. Buy a new car or used car online to make your car purchase easy. Get New Hampshire DMV contact information to obtain DMV services. NH DMV locations are available throughout the state. How Do I Get A Drivers License? To apply for a drivers licenses, an applicant must meet the eligibility criteria based on your state. You must also submit necessary documents and pass a driving test through your local DMV. To find out more about the requirements in your state, click here. Can I Renew My Drivers License? The process of renewing a drivers license can be completed prior to the date of expiry or within a set period of time after the expiration date, depending on the state. For more information about renewing a drivers license in your state, click here. How Can I Check If My License Is Suspended? To check if your license is suspended, you will have to obtain a copy of your driving record. You can get a driving record at your local DMV, or you can purchase a driving record online through DMV.com. How To Take Points Off My License? The only way to remove points off a drivers license is by enrolling in traffic school. Depending on the state you live in, determines how many and if you can remove points from your license. How To Get A Learners Permit? Before applying for your learners permit, you must make sure you meet your state’s age limit requirements. Most states allow minors to apply when they are at least 15. There are certain requirements that must be met like drivers education and a DMV written exam. Where Can I Take Drivers Ed? You can enroll in drivers education at your high school, or online. If you take your drivers ed course online, you will be able to study on your own time and not have to spend time in a classroom, plus you will still earn 2.5 credits towards highschool. How Do I Pass My DMV Permit Test? It is common to fail a learners permit exam the first time. This is because many first time drivers study the wrong way just by quickly reading the official state driver’s manual. It is recommended to actively study for the DMV written test by taking DMV practice tests once you finish your states handbook. DMV.com’s Practice Permit Test features questions from relevant topics that will be your DMV test. How Do I Get A DUI Lawyer? It is important to seek legal counsel from a qualified attorney, to determine if you should proceed on your own or with a lawyer. DUI penalties could only be high fines, but a DWI attorney is the best professional to conclude if more serious repercussions are a possibility. Can I Remove Points From My Driving Record? Depending on your state, it is possible to remove points from your driving record. Most states offer one of two ways to reduce points from your record, one, by completing a state-approved driver improvement course or by keeping your record clean for a certain period of time. How Do I see How Many Points Are On My Driving Record? By ordering a copy of your driving record, you will be able to see how many points are on your record. A copy of your driving record will also include your driver’s license status, violation convictions (including DUIs), endorsements, restrictions and administrative actions that are associated with your drivers license and reportable in your state according to their policies. Accidents and points will only show if applicable based on your state. Does Comparing Auto Insurance Quotes Make A Difference? By comparing auto insurance quotes, you can save up to $70 a month. About 38% of American motorists haven’t compared or evaluated their car insurance costs within the last three years, causing them hundreds of dollars a year. Start comparing auto insurance quotes now. Lowering your auto insurance premiums comes with time. An easy way to do so is by enrolling in traffic school and receiving a safe driver discount. Before you enroll, check with your current insurance provider to make sure they accept the course. How To Apply For Car Insurance Online? To apply for car insurance online, you can visit any of the major provider’s website. But before you apply for car insurance online, we recommend comparing auto insurance quotes to guarantee the best deal for you. Click here to learn more about applying and comparing auto insurance quotes. Cut out DMV’s bureaucracy. DMV.com has easy guides for drivers license, vehicle registration, license plate, emissions and other motor vehicle issues online. No one can do better than DMV.com when it comes to finding the facts you need regarding New Hampshire DMV quickly! We assure that all the New Hampshire information on: driver’s license, vehicle registration, renewals, replacements, auto insurance, driving schools and more can be found here. Readers can also contribute to this website, by commenting the pages, giving their feedback, like us on Facebook and interact with other users. That way you can help us be always up-to-date with all info regarding NH Division of Motor Vehicles. We have easy-to-understand articles and easy-to-find navigation system that will make your issues even interesting. Just use the “search” feature, or the navigation sections to help you find exactly what you are looking for. We are proud to say that this is privately owned website that’s not affiliated with any government agency, thus dealing with government bureaucracy is not an issue here. Study for your DMV learners permit exam with our comprehensive and up-to-date practice tests and study guides. Our learners permit practice test is made up of a unique set of driving questions, designed to help you ace the driving exam on your first try. Our exam prep tools are designed to give you a complete understanding of all the topics covered on the real DMV exam. We want to hear from you! Post a message below and hear from one of our DMV Advisors.